The past decade has seen a radical shift in the way we consume media, services and software. Not so long ago you would have schedules to dictate your TV viewing, a film would be on a DVD, your favourite music on CD and getting either would involve visiting a shop or ordering online and waiting. Now, you download tens of thousands of films and TV shows when you want. You can download the latest album directly to your device instantly and your phone, tablet and computer are spoilt with millions of apps. The world has become digital and almost anything media, software or service related can be downloaded, ready for use immediately on your devices. 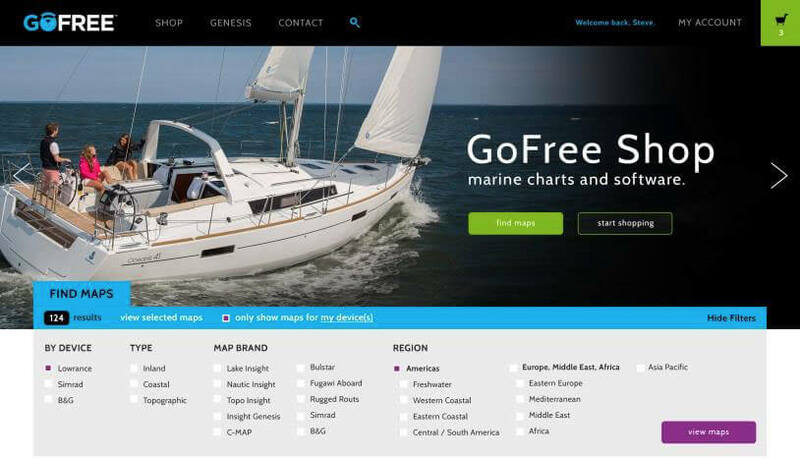 Recognising this growing trend marine electronics firm Navico have launched GoFree. GoFree is a digital platform designed to deliver content, services and updates to a range of Lowrance multifunction display units, mobile devices (iOS / Android) and other Navico brand systems such as Simrad and B+G, wherever there is an internet hotspot. 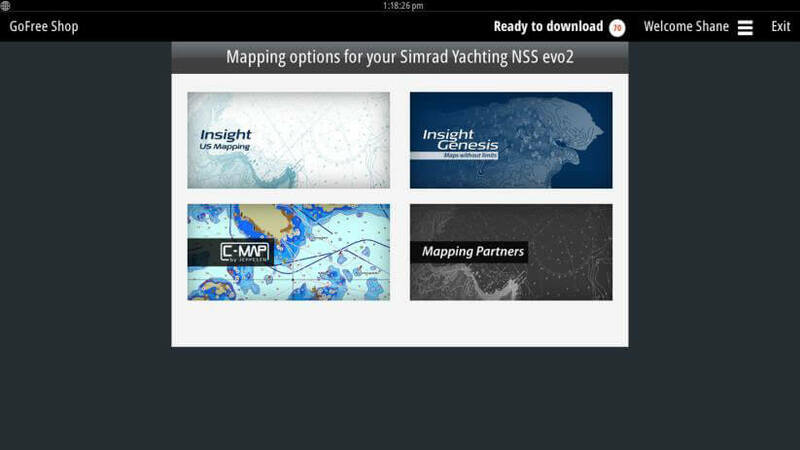 The GoFree product line includes the Insight Genesis personalised mapping service with Social Map community data sharing, BioBase aquatic mapping and the GoFree Shop, which offers content and mapping from Jeppesen, Navionics and other Navico Partners. You can download both personal and Social Maps completely free. Most of us have downloaded apps and tunes to our mobile devices through a cloud service such as iTunes and Navico have taken this concept and applied it to the marine electronics world. Using our familiarity with this style of purchase and download to create the GoFree Shop, an industry first innovation that puts the shop directly on your unit. GoFree Shop enables a user to download the latest software updates and mapping data directly to the unit. If you’ve got a good enough 3G/4G signal whilst you’re on the water you can setup a Wi-Fi hotspot on your phone and connect your unit to download data whilst you’re fishing. Really useful if you want to tap into the Insight Genesis Community to see if any other anglers have marked your location previously and added useful notes. The GoFree Shop is fully compatible with a range of Lowrance, Simrad and B+G multifunction display units such as the Lowrance HDS Gen2 Touch and Gen3 units, the Simrad NSO Evo2 and the B&G Zeus2. GoFree Shop requires a one off free software update as well as a GoFree WiFi-1 Wireless Gateway with access to a Wi-Fi hotspot or mobile tethered link. For units with built in Wi-Fi such as the HDS Gen3, the WiFi-1 Wireless Gateway is not required. The GoFree Shop changes the way anglers obtain content for their marine devices by allowing the purchase, direct download and immediate use of Insight Genesis and third party maps from other GoFree partners. Ensuring anglers have immediate access to the charts and data they need whether at home, at the dock or out on the water. Like all good integrated software ecosystems, the GoFree Shop will also keep your compatible unit fully up to date via automatic software update notifications, direct to unit downloads and installation. Insight Genesis users can use the GoFree Shop to upload their sonar logs directly from the unit to the online service for personal chart creation and to share their data via Social Map. This is a huge shift from old where you had to transfer data between unit and computer to share with others or keep a personal record you could view at home. Whilst major leaps have been made providing GoFree and downloadable services on each unit, Navico haven’t ignored the land bound angler who wants to study their chart data when they can’t get on the water. The GoFree shop will also be launched online, allowing anglers to download chart data and software from a PC or Mac using their same existing login. The GoFree Shop will provide a fast and convenient online resource for discovering and downloading new content, providing instant access to a large collection of marine mapping data. The online store will be ever expanding allowing users to browse, purchase and download content for their compatible device and then transfer them to their units via a memory card or USB flash drive. It’s still early days for this system but what I’ve seen so far, I love. If you’re used to using any kind of modern mobile device from an iPhone to Kindle you will be familiar with the ease and immediacy that cloud based stores give you. Having that level of simplicity at your fingertips on your boat devices is going to be a real winner for anglers all over. Key integrations to other devices such as your mobile phone and tablet add a bit extra so you can review your data when you are away from your unit. There is so much more within this system that is planned, with the investment and emphasis that Navico are putting into GoFree I can see it becoming by far and away the best and most comprehensive digital solution for the small boat angler. Launching in stages with both on unit and online functions going live in Q1 of 2015.